Chalk this up in the “Things We No Longer Have To Consider” category: One of the unfortunate side-effects of releasing a Christmas song in the singles era is the issue of what would be the ultimate fate of the non-holiday B-side of that record. No matter how you looked at it this unique problem was a no-win situation from the outset. The Christmas song was the one that was going to be promoted and get the spins but then once the holidays were over and the tree came down the record would inevitably drop off the map altogether, tossed into a box with the ornaments and tinsel to be forgotten for another eleven months. Other labels had seen this last year with their seasonal releases and attempted to re-issue them in January with a new song replacing the Christmas side but that proved woefully ineffective because those who bought the first pressing didn’t want to pay full price for one new song rather than two new ones, that is if they were even aware that a new side had been released to begin with. If anyone in the 1940’s rock scene had the potential to buck this trend it would’ve been Little Willie Littlefield who was hot as a pistol at this point, riding two sizable hits in his first two releases since arriving at Modern Records last summer. But even with his far-reaching appeal that wouldn’t be the case as once the Christmas tune had run its course the record was off the air, out of the jukes and a distant memory by New Year’s, while its flip side – despite being legitimately hit worthy in its own right – slipped quickly into oblivion. So whaddaya say, maybe it’s time we ask Santa Claus to rescue it from the Island Of Misfit Toys and Forgotten Records. We’ve taken some delight in criticizing the likes of the Bihari brothers, the trio of siblings who owned Modern Records and helped themselves to co-writing credits for more songs than you’d think imaginable, but to be fair they didn’t yet try copping any from Littlefield. That’s not to say they wouldn’t in the future… maybe they were just waiting until after the holidays had passed so ol’ St. Nick didn’t put them on the naughty list and bypass their house on Christmas Eve. But we as much as we may loathe some practices that stained the record industry for years and decry those who were most shamelessly guilty of perpetrating those crimes, we also do willingly give credit where credit is due and in this case Modern Records had done an excellent job in deciding what songs to pair with one another on Littlefield’s singles. This A-side/B-side stylistic diversity is a pet peeve around here, as any regular reader of this site surely knows, but the benefits of pursuing that goal can be seen by just doing a cursory study of Little Willie’s three singles to date. The first, featuring the hit It’s Midnight (No Place To Go), was coupled with an instrumental Midnight Whistle, which aside from choosing a title a little too similar to the top side, allowed new listeners a chance to hear both his vocal prowess and his piano playing ability right out of the gate. Last month’s ballad Farewell doubled down on the morose sentiments his initial hit offered, but they smartly paired that with the sly wit and more uptempo jolt of Drinkin’ Hadocol. The one obvious advantage to mixing up the style of songs on each single is by doing so you had the potential to expand interest in the artist. Yes, Littlefield was now making a name for himself as a forlorn singer continually beset by an aching heart, as even Merry Xmas would attest, but lest we forget he began his career on smaller labels by pounding out heart stopping boogies on the piano and now with Come On Baby he was attempting to make a case for himself as someone to kick start a party with some raw, loud and lusty uptempo rock ‘n’ roll’s vocals as well. For those who care about such things – and I’m assuming that’s virtually everyone who is here reading about obscure non-hit B-sides from 70 years ago – there’s another interesting aspect of Come On Baby to study and that’s the fact it was the very first song cut at Littlefield’s initial session upon moving to Los Angeles. Now just so there’s no confusion his first overall session for Modern Records took place in Houston at the tail end of June (following two separate lengthy demo-only sessions a few months back, also in Houston where Willie was from) . The three songs cut June 18th formed both sides of his debut, which was released almost immediately, and the B-side of his follow-up in the fall. Since we’ve reviewed five Littlefield songs on Modern that means we HAVE heard cuts from Los Angeles already, including the top side of this one which they laid down only recently. But remember that Littlefield was a 17 year old kid when these sides were cut and he’d just left his home, his family and his friends behind and headed west with a suitcase full of hopes and dreams, a few pairs of socks and not much else (surely you don’t think he got a cash advance, do you?). I don’t care who you are and what the circumstances of your move might be, but that’s the kind of moment in life that has even the most cocksure kid feeling a little uncertain of himself. In all likelihood he’d only just arrived in town in the past few days, who knows where they put him up to stay and whether he had a driver’s license and use of a car or was left to rely on riding a bus to get around. Had he any experience cooking meals or writing checks or budgeting for his expenses? The only familiar setting to him at this point was probably behind a piano so maybe the studio would be where he’d feel most comfortable… except unlike the facilities back in Houston, which Joe Bihari had called the worst he’d ever been in, this was a real studio and instead of playing with his friends and fellow teenaged hot-shots he’d known around town growing up, this time he would be working with a band comprised of professional musicians whom he’d presumably only just met, maybe even that very day! If he slipped into the men’s room and gagged up his orange juice from that morning you could hardly blame him. So it was probably a smart decision for them to choose something uptempo to kick off the session with in order for him to burn off some of that nervous energy. But if he was nervous, you’d never know it listening to Come On Baby because from the first notes he lays down everything seems to fall together effortlessly, as if he knew that he’d finally reached the position in life he was destined for since birth and was going to live it up to the fullest. The horns kick things off, riffing steadily with accents tossed in by Chuck Norris on guitar before Littlefield adds his two cents on the keys in the rousing instrumental opening. The sound is tight but hard driving, bursting with energy yet still focused and under control. Before he even opens his mouth Littlefield has this record’s engine already purring and is about to shift into fourth gear. When he does start to sing it’s like a coiled spring being released. He leaps out of the speakers with a purpose, not raising his voice as much as just altering his delivery from the mellow introspection we’re used to of late with him and replacing it with a finely tuned whine. The funny thing is the theme of Come On Baby is much like the slower numbers in that he’s having issues with a girl, except in this case he’s far more in command of the situation. Here he’s the one laying down the law and seems unconcerned with her response. But the lyrics here are just superfluous, not to mention sort of lost in the haze of the recording, for it’s all overwhelmed by the forward propulsion of the band churning behind him. The horns are locked in formation, the guitar responds with equal assertiveness, the rhythm section never wavers and Littlefield keeps his piano darting in and out like dive bombers attacking a listing battleship at sea. There’s nothing about the individual playing that stands out, no pyrotechnics in other words, but in many ways it’s almost the ideal prototype of a backing track for a rock record in 1949. 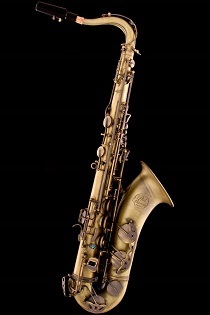 Everything fits together, each of the components playing off one another with the stated purpose to keep it grooving relentlessly and, as is the standard requirement for this era, it’s got a rip-roaring tenor sax solo midway through. Ahh, but that’s the next piece of evidence we have to try and study because as good as it is – and it’s very good, playing with equal parts grit and fire, winding upwards as it goes along – there’s the little matter of just who is blowing this horn that we remain slightly uncertain about. In the review for Littlefield’s recent outings we mentioned how his sound was remarkably consistent even with totally different musicians backing him. 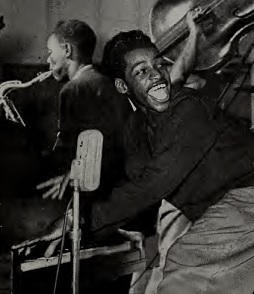 He’d started with local kids from Houston, including fellow teenager Don Wilkerson on sax, who by the way was now one of Amos Milburn’s touring band, the Aladdin before jumping to Ray Charles’ peerless group down the road. On this session the tenor saxman is reputedly Earl Jackson, who we’ve met before, backing Smilin’ Smokey Lynn and being the featured horn – and the namesake of the song Jackson’s Blues – on its flip side credited to trumpeter Don Johnson back in March. Jackson then laid down his own rock effort this summer, the more than acceptable Woman Don’t Want A Real Good Man No More. In other words, he was a qualified guy to be handling the lead role here. But heading into the break Littlefield cries out, “Blow Maxwell” implying that this is none other than Maxwell Davis, the premiere tenor sax ace on the West Coast in the late 1940’s and early 1950’s. The answer is we don’t really know but we have a couple of possibilities. The first is that it might in fact actually be Maxwell Davis playing – and running the session for that matter. In addition to being the go-to guy for playing behind all types of artists, from rock to jazz to blues, he increasingly was becoming the guy being called on to produce those records, work out the arrangements and possibly even hire the other musicians for sessions on a wide array of labels in Los Angeles. He may have been most closely associated with Aladdin Records, where he oversaw all of Amos Milburn’s sides, but he’d also done work for MGM and Supreme and he’d wind up working with Modern quite often for the next decade, eventually being named their lead producer in the Fifties. Why wouldn’t it be him? Well, because the session information we have doesn’t mention him and it’s unlikely that he’d be handling these roles and NOT appear on the session logs. It’s not like he was unknown and it’s doubtful he had an exclusive contract with another label to necessitate his anonymity (for what it’s worth his own record as lead artist, Hung Out backed with Th’ Bop Hop had just come out on Swing Beat records last month). So we dig a little deeper and remember that Littlefield also yelled out the same thing before when the sax player was his buddy Wilkerson. Once might be a mistake in the session information, but not twice, which means if it wasn’t Davis then this was an intentional misrepresentation. Ahh, but intentional by whom? Modern Records, wanting to deceive sharp-eared listeners into believing an otherwise largely anonymous behind the scenes figure was adding his horn to the record? While certainly the Bihari brothers were the kind who would do something like that if they thought it’d help sell the record, it’s highly doubtful that it WOULD give the release a commercial boost. I mean, who in the rock buying market really knew the contributions of Maxwell Davis anyway? Which leaves Littlefield himself, an avowed fan of Milburn, currently the number one artist in rock who frequently shouted the same words – ”Blow Maxwell!” on his records… the difference being that Maxwell Davis actually WAS blowing on those cuts by Milburn. Now a seventeen year old like Little Willie might not know, nor probably care, about this minor detail and just liked the sound of it enough to repeat. Maybe he didn’t even think about it when he was singing, it might’ve been just something he picked up and threw into his songs for the hell of it. I can’t imagine Earl Jackson would be too pleased if Davis was getting credit for his work, but Modern wouldn’t have minded and even Davis himself, if he wasn’t involved, got some small publicity among other labels who might hear it and say to themselves they needed to get this Maxwell Davis cat for their sessions too. Whoever is playing the sax though does a bang up job and that in the end is what matters most. Years later we can understand all of the reasons why Come On Baby didn’t become Littlefield’s third hit in a row. The fact it was on the B-side of a Christmas record, thus not getting the spins right away and then probably no longer being stocked once the holidays passed is the most obvious culprit. It was also released on the heels of his last hit which was still burning up the jukeboxes around the country, and even his initial hit from last summer was still charting in some places, which leads to the question of just how many simultaneous hits is one kid entitled to anyway? You can also claim that its rowdier roughhouse sound was too unlike those previous two hits to not connect in the same way with the same listeners, but that’s probably stretching things. The truth is that sometimes really good records by really good artists somehow slip through the cracks and this was one of those times. But while a hit would’ve been nice to confirm to Modern and Littlefield that this approach was just as commercially valid as the more downbeat songs, there can be no doubting that he handled this more rousing style just as well – if not better – than the drowsier numbers that made him a star. Here he takes a rather basic composition without much depth and a pretty straightforward arrangement and injects it with a lethal dose of electricity, turning it into gold by doing everything as well as it can be done while aided by musicians who do their jobs with equal proficiency. To call Come On Baby something of a conveyor belt product would be unfairly dismissing the skill it takes in carrying all of these roles out, but the fact remains rock ‘n’ roll had gotten to the point now where a top notch artist, band and producer could indeed churn these things out with increasing regularity now that they’d all made their bones. No longer was it a matter of trying to catch lightning in a bottle, now the lightning was in them all and it was just a matter of harnessing it to put on another record. 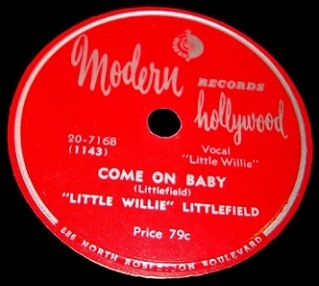 Leave a reply on "Little Willie Littlefield: “Come On Baby”"